What is the Life Cycle of Stars? Much like any living being, stars go through a natural cycle. This begins with birth, extends through a lifespan characterized by change and growth, and ends in death. Of course, we’re talking about stars here, and the way they’re born, live and die is completely different from any life form we are familiar with. For one, the timescales are entirely different, lasting on the order of billions of years. Also, the changes they go through during their lifespan are entirely different too. And when they die, the consequences are, shall we say, much more visible? Let’s take a look at the life cycle of stars. Stars start out as vast clouds of cold molecular gas. The gas cloud could be floating in a galaxy for millions of years, but then some event causes it to begin collapsing down under its own gravity. For example when galaxies collide, regions of cold gas are given the kick they need to start collapsing. It can also happen when the shockwave of a nearby supernova passes through a region. As it collapses, the interstellar cloud breaks up into smaller and smaller pieces, and each one of these collapses inward on itself. Each of these pieces will become a star. As the cloud collapses, the gravitational energy causes it to heat up, and the conservation of momentum from all the individual particles causes it to spin. As the stellar material pulls tighter and tighter together, it heats up pushing against further gravitational collapse. At this point, the object is known as a protostar. Surrounding the protostar is a circumstellar disk of additional material. Some of this continues to spiral inward, layering additional mass onto the star. The rest will remain in place and eventually form a planetary system. Depending on the stars mass, the protostar phase of stellar evolution will be short compared to its overall life span. For those that have one Solar Mass (i.e the same mass as our Sun), it lasts about 1000,000 years. 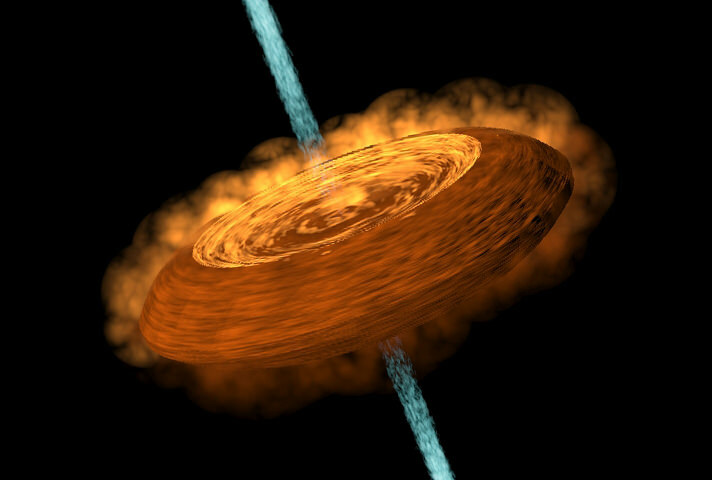 A T Tauri star begins when material stops falling onto the protostar, and it’s releasing a tremendous amount of energy. They are so-named because of the prototype star used to research this phase of solar evolution – T Tauri, a variable star located in the direction of the Hyades cluster, about 600 light years from Earth. A T Tauri star may be bright, but this all comes its gravitational energy from the collapsing material. The central temperature of a T Tauri star isn’t enough to support fusion at its core. Even so, T Tauri stars can appear as bright as main sequence stars. The T Tauri phase lasts for about 100 million years, after which the star will enter the longest phase of its development – the Main Sequence phase. Eventually, the core temperature of a star will reach the point that fusion its core can begin. This is the process that all stars go through as they convert protons of hydrogen, through several stages, into atoms of helium. This reaction is exothermic; it gives off more heat than it requires, and so the core of a main sequence star releases a tremendous amount of energy. This energy starts out as gamma rays in the core of the star, but as it takes a long slow journey out of the star, it drops down in wavelength. All of this light pushes outward on the star, and counteracts the gravitational force pulling it inward. A star at this stage of life is held in balance – as long as its supplies of hydrogen fuel lasts. And how long does it last? It depends on the mass of the star. The least massive stars, like red dwarfs with half the mass of the Sun, can sip away at their fuel for hundreds of billions and even trillions of years. 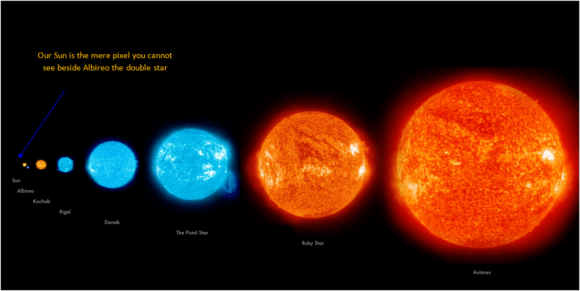 Larger stars, like our Sun will typically sit in the main sequence phase for 10-15 billion years. The largest stars have the shortest lives, and can last a few billion, and even just a few million years. Over the course of its life, a star is converting hydrogen into helium at its core. This helium builds up and the hydrogen fuel runs out. When a star exhausts its fuel of hydrogen at its core, its internal nuclear reactions stop. Without this light pressure, the star begins to contract inward through gravity. This process heats up a shell of hydrogen around the core which then ignites in fusion and causes the star to brighten up again, by a factor of 1,000-10,000. This causes the outer layers of the star to expand outward, increasing the size of the star many times. Our own Sun is expected to bloat out to a sphere that reaches all the way out to the orbit of the Earth. The temperature and pressure at the core of the star will eventually reach the point that helium can be fused into carbon. Once a star reaches this point, it contracts down and is no longer a red giant. Stars much more massive than our Sun can continue on in this process, moving up the table of elements creating heavier and heavier atoms. A star with the mass of our Sun doesn’t have the gravitational pressure to fuse carbon, so once it runs out of helium at its core, it’s effectively dead. The star will eject its outer layers into space, and then contract down, eventually becoming a white dwarf. This stellar remnant might start out hot, but it has no fusion reactions taking place inside it any more. It will cool down over hundreds of billions of years, eventually becoming the background temperature of the Universe. We have written many articles about the live cycle of stars on Universe Today. Here’s What is the Life Cycle Of The Sun?, What is a Red Giant?, Will Earth Survive When the Sun Becomes a Red Giant?, What Is The Future Of Our Sun? We have recorded several episodes of Astronomy Cast about stars. Here are two that you might find helpful: Episode 12: Where Do Baby Stars Come From?, Episode 13: Where Do Stars Go When they Die?, and Episode 108: The Life of the Sun. NASA: How Do Stars Form and Evolve? A star is a star, right? Sure there are some difference in terms of color when you look up at the night sky. But they are all basically the same, big balls of gas burning up to billions of light years away, right? Well, not exactly. In truth, stars are about as diverse as anything else in our Universe, falling into one of many different classifications based on its defining characteristics. All in all, there are many different types of stars, ranging from tiny brown dwarfs to red and blue supergiants. There are even more bizarre kinds of stars, like neutron stars and Wolf-Rayet stars. And as our exploration of the Universe continues, we continue to learn things about stars that force us to expand on the way we think of them. Let’s take a look at all the different types of stars there are. A protostar is what you have before a star forms. A protostar is a collection of gas that has collapsed down from a giant molecular cloud. The protostar phase of stellar evolution lasts about 100,000 years. Over time, gravity and pressure increase, forcing the protostar to collapse down. All of the energy release by the protostar comes only from the heating caused by the gravitational energy – nuclear fusion reactions haven’t started yet. A T Tauri star is stage in a star’s formation and evolution right before it becomes a main sequence star. This phase occurs at the end of the protostar phase, when the gravitational pressure holding the star together is the source of all its energy. T Tauri stars don’t have enough pressure and temperature at their cores to generate nuclear fusion, but they do resemble main sequence stars; they’re about the same temperature but brighter because they’re a larger. T Tauri stars can have large areas of sunspot coverage, and have intense X-ray flares and extremely powerful stellar winds. Stars will remain in the T Tauri stage for about 100 million years. The majority of all stars in our galaxy, and even the Universe, are main sequence stars. Our Sun is a main sequence star, and so are our nearest neighbors, Sirius and Alpha Centauri A. Main sequence stars can vary in size, mass and brightness, but they’re all doing the same thing: converting hydrogen into helium in their cores, releasing a tremendous amount of energy. A star in the main sequence is in a state of hydrostatic equilibrium. Gravity is pulling the star inward, and the light pressure from all the fusion reactions in the star are pushing outward. The inward and outward forces balance one another out, and the star maintains a spherical shape. Stars in the main sequence will have a size that depends on their mass, which defines the amount of gravity pulling them inward. The lower mass limit for a main sequence star is about 0.08 times the mass of the Sun, or 80 times the mass of Jupiter. This is the minimum amount of gravitational pressure you need to ignite fusion in the core. Stars can theoretically grow to more than 100 times the mass of the Sun. When a star has consumed its stock of hydrogen in its core, fusion stops and the star no longer generates an outward pressure to counteract the inward pressure pulling it together. A shell of hydrogen around the core ignites continuing the life of the star, but causes it to increase in size dramatically. The aging star has become a red giant star, and can be 100 times larger than it was in its main sequence phase. When this hydrogen fuel is used up, further shells of helium and even heavier elements can be consumed in fusion reactions. The red giant phase of a star’s life will only last a few hundred million years before it runs out of fuel completely and becomes a white dwarf. When a star has completely run out of hydrogen fuel in its core and it lacks the mass to force higher elements into fusion reaction, it becomes a white dwarf star. The outward light pressure from the fusion reaction stops and the star collapses inward under its own gravity. A white dwarf shines because it was a hot star once, but there’s no fusion reactions happening any more. A white dwarf will just cool down until it because the background temperature of the Universe. This process will take hundreds of billions of years, so no white dwarfs have actually cooled down that far yet. Red dwarf stars are the most common kind of stars in the Universe. These are main sequence stars but they have such low mass that they’re much cooler than stars like our Sun. They have another advantage. Red dwarf stars are able to keep the hydrogen fuel mixing into their core, and so they can conserve their fuel for much longer than other stars. Astronomers estimate that some red dwarf stars will burn for up to 10 trillion years. The smallest red dwarfs are 0.075 times the mass of the Sun, and they can have a mass of up to half of the Sun. If a star has between 1.35 and 2.1 times the mass of the Sun, it doesn’t form a white dwarf when it dies. Instead, the star dies in a catastrophic supernova explosion, and the remaining core becomes a neutron star. As its name implies, a neutron star is an exotic type of star that is composed entirely of neutrons. This is because the intense gravity of the neutron star crushes protons and electrons together to form neutrons. If stars are even more massive, they will become black holes instead of neutron stars after the supernova goes off. The largest stars in the Universe are supergiant stars. These are monsters with dozens of times the mass of the Sun. Unlike a relatively stable star like the Sun, supergiants are consuming hydrogen fuel at an enormous rate and will consume all the fuel in their cores within just a few million years. Supergiant stars live fast and die young, detonating as supernovae; completely disintegrating themselves in the process. As you can see, stars come in many sizes, colors and varieties. Knowing what accounts for this, and what their various life stages look like, are all important when it comes to understanding our Universe. It also helps when it comes to our ongoing efforts to explore our local stellar neighborhood, not to mention in the hunt for extra-terrestrial life!